So you crush all your friends, you dominate on for glory, and you've heard about a local tourney and you'd like to show up and see how good you really are, but you aren't really sure of how it works or what to expect? Going into your first offline tourney hungry for a win can motivate you to show up, but its very likely you wont do very well at your first tourney. I've seen it time and time again, you beat all your friends and then you go to a tourney confident, get crushed, and see just how deep the game can be. Maybe I'm just bummed you out a bit and made it sound less exciting, but dont let me talk you out of trying it. Seeing how deep the rabbit hole goes can be really cool. Seeing how far people can take something you love can be extremely exciting, and if you want to get in on that, the harder the challenge the more rewarding right? Its ok to go into things with confidence, just dont set expectations high at first and dont let it get to you if you dont do well, nobody makes it on the first jump https://www.youtube.com/watch?v=oXv3SSijPFc - metaphor not entirely relevant. Maybe you're not really the competitive type, you dont really care about being good but you love to play smash, going to tournaments can still be a really fun way to meet new people who share the same love passion and hobby that you do, you get to be part of a community you care about, and you can make friends for life. Either way, no matter what your motivation is or how much you like to compete, you are going to have an awesome time, tourneys are sick and the community here is very friendly and full of cool people. I still haven't really answered how it all works though, so heres a few things to keep in mind for your first few tourney experiences. Make sure you bring your own controller, there are never any supplied, everyone has and brings their own. Occasionally people will have spares for you to borrow but this is usually pretty rare. If your controller option of choice uses batteries (eg wiimote, WiiU Pro controller, etc) make sure you have extra batteries, charging cables, etc since spares of these controllers and their charging equipment are practically non existent. Bringing setups (Monitors for WiiU, CRT TVs, consoles with smash games, power boards, etc) is a community thing and we could always do with more setups, the more setups that are brought the better and faster the tournament will run, and the more likely we will get time for the extra fun stuff and friendlies. In general there is an attitude of "if you can bring a setup please do." For most peoples first tournament, if you feel uncomfortable bringing a setup you are by no means obligated or expected to bring one, I would recommend that you don't at first just to make things a bit easier and simpler for you. Sometimes pieces of equipment occasionally get confused if they are unmarked, or left behind (in which case if its unmarked we don't know who it belongs to). Labeling any and all of your belonging is a very good idea and will greatly reduce the likeliness that someone else mixes your things with theirs (and vice versa). Making your controller look unique is a good way of making it identifiably yours, most people do this by putting a sticker of some kind (pokemon stickers are common in my scene) on the controller so that they can identify it. Custom paint jobs are another idea. Understanding the tournament format before you go can help you feel more orientated and have a better idea of whats going on. The first stage will typically be pools. Pools is where the entrants are separated into groups with approximately the same number of players (say you had 24 players, you might have 6 pools of 4 players for instance). They are randomized and are also usually seeded, which means that the trending top players at the time all get a seed. These seeded players get separated which prevents stacked pools (that is pools that are unbalanced with too many top players in a single pool). There are 2 different formats that pools can take. Round Robin Pools - each player will play each other player in their pool and the results will be recorded and tallied. The players are then ranked within their pools by their Wins and losses. The advantage of this format is that everyone gets in a lot of games however the disadvantage is that it takes up a lot of time. Bracket Pools - players in a pool get put into a small DE bracket (see below) which is played out except for grand finals of that bracket. Bracket pools is mainly a method of separating a large DE Bracket, that includes all entrants, into manageable chunks so that the event runs more smoothly and on time. The disadvantage with this format is that some players won't get much tournament matches in but since it saves a lot of time over Round Robin pools it is sometimes necessary for an event to finish on time. I dont like Bracket pools and nobody I've ever talked to about it likes them either. The actual format used at any event might sometimes change depending on how much time there is and whether there is enough setups for number of entrants. After pools, the top x amount of players will move through pools to the second stage, the number of x depending on how many pools there were and how big the bracket is. The second stage will be a Double Elimination (DE) Bracket, which is a bracket that has a winners bracket and a losers bracket in it. When you lose the first time you drop out of winners bracket and into losers bracket, if you lose again while in losers bracket you are out of the tournament. The winner of the winners bracket and the winner of the losers bracket go on to face each other in the grand finals, which means that if you are knocked into losers bracket, you still have a chance to win the entire tournament. If you make it into bracket remember you need to lose two sets before you are eliminated, make sure you keep that in mind. 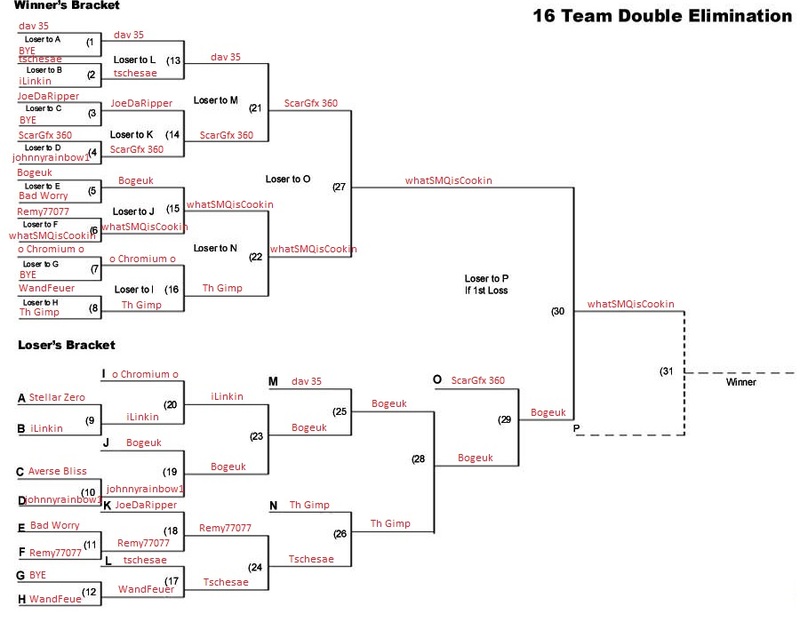 Here is an example of a what double elimination bracket looks like. There are other formats sometimes run at tourneys like ladder or Swiss, but these are pretty rare, at least in Australia. If its your first time showing up, and you show up with a friend, it'd be really lame for the two of you if you had to play each other in pool (and thus one of you hampers the others chance at getting further) since you play all the time and since you are around new people it'd be better for you to play against new people. Letting the organizers know you are together can help prevent them putting you in the same pool, if you are put into the same pool, letting the organizers know and requesting a change should be done as early as possible (ideally before any matches are played in any of the pools). The organizer doesn't have to honor your request, but you'll find pretty much any organizer will help you out like this if you let them know early enough and are polite about it. Most setups will be dedicated to tournament usage at the start of the day, which means little to no friendlies. If at anytime you are asked to stop playing so someone can play out their tournament match please do so immediately. Similarly, if you are asked to play a tournament match please stop your friendlies and do so immediately. This helps the tournament run to schedule and later in the day, when some players are knocked out, we will have more setups than needed so there will be plenty of time to play friendlies. As a new player in this environment you should not expect to win right away, but you should learn from the experiences and grow as a player and community member. If you lose quickly at a tournament don't be discouraged, most players have been practicing hard and playing competitively for a while and have more experience, but if you stick around for a bit and practice you will find yourself catching up to their skill level pretty quickly. Always remember that you having a great experience is important to your TO's, so if you feel you are not having a great experience let them know and they'll usually work with you towards making each and every tournament as much fun as they can be for you and for all. After the tournament is finished, don't just wait for the next one. Get involved in the scene, it's a great way to learn, ask questions, find people to play (either online or close to you) and make new friends. There are many more things happening than just tournaments and many community members have impromptu meets where they invite other smashers over to their places. The Smash Community can become one of the best communities you have been involved in and many members have formed close life-long friendships with other smashers, not only in Australia but all over the world. You can make amazing friendships with people from other country's. So get involved, we would love to have you. Qldsmash.com is an amazing website, its a great place to meet and play players on wifi, sick of playing laggy matches on for glory and wish you could play and talk to other Australians? This is the place to go. It also tracks tournament result data for all of Australia, This is the first place I would recommend checking out. There are a few Australian Streams that are worth keeping an eye on. By SpaceJam - 4/05/2016 Why the great Spacejam is going to win BAM8.